Hey, that's a quite strange place to park your car. 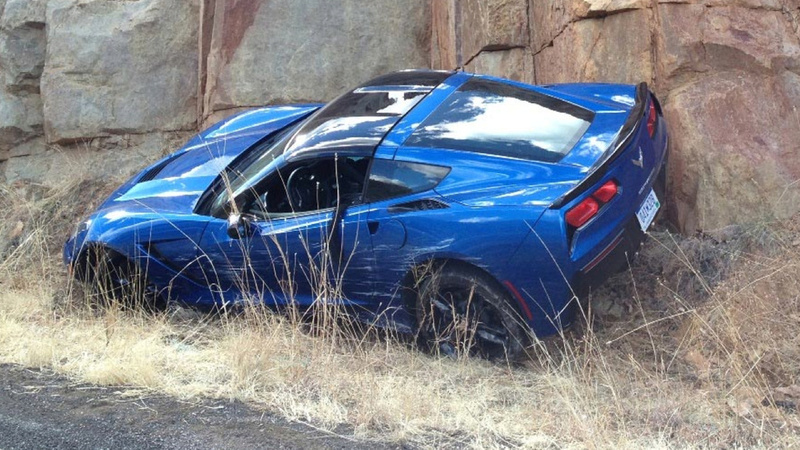 No wait, that looks like the first crash of the very new Corvette C7 Stingray. Surprisingly, the accident didn't took place in China, but more precisely in Arizona, USA. Although we don't know how exactly the wreck took place, the author of this picture claims that the Corvette has hit the guardail and then bounced outside of the road against the rocks. Although we don't know how exactly the wreck took place. You are making it like you are apart of this. It should be Although "THEY"
During evaluation, the driver caught the inside tire caught the edge of the pavement during a tight corner, leading to the accident. Well since he does reviews on a different cars/events, it makes sense for him to save "although we don't know" since he was probably trying to find out what happened. Does anyone know how this accident happened? I've looked over the photo and I don't understand if he veered off the side of the road or if somehow fell off of a small cliff. Did the driver own the car? I would hope he has a good attorney if he has any sort of criminal charges against him for reckless driving or something similar.